Move oven rack to lower middles position and preheat oven to 400°. Heat the oil on the stove in a large skillet over medium heat until shimmering. Add the onion powder, salt, chili powder, garlic powder, cumin, and sauce and cook until fragrant. Slowly stir in the tomato sauce and water. Bring to a simmer and cook uncovered until slightly thickened, about 5 minutes. Add the cream and then season with salt and pepper to taste. Set aside until needed. 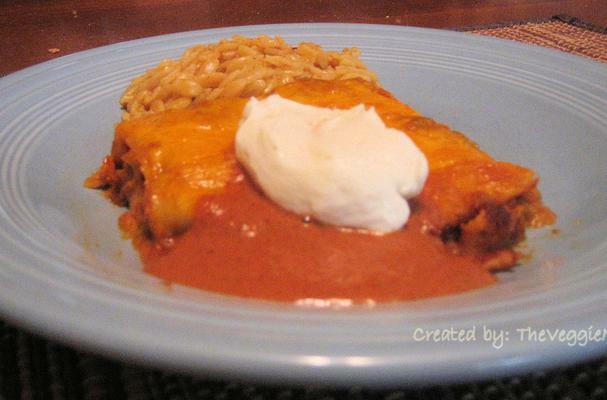 Mix together 2 1/2 cups of the shredded cheese, 1/2 cup of the sauce, the chillis, and the 1 tablespoon of taco seasoning. Pour 1/2 cup of sauce into the bottom of a 13x9 inch baking dish, top with layer of tortillas (breaking up tortillas to get into corners), top with layer of cheese/chili filling. Repeat layers, ending with a layer of sauce. Top with 1/2 cup of cheese. Bake for 20 to 25 minutes or until cheese is melted and sauce is bubbling. Serve with sour cream and any remaining sauce. Am I missing something? I don't see any type of chilies listed in the ingredients, but it says add chilies in step 3. 1.Move oven rack to lower middles position and preheat oven to 400°. 2.Heat the oil on the stove in a large skillet over medium heat until shimmering. Add the onion powder, salt, chili powder, garlic powder, cumin, and sauce and cook until fragrant. Slowly stir in the tomato sauce and water. Bring to a simmer and cook uncovered until slightly thickened, about 5 minutes. Add the cream and then season with salt and pepper to taste. Set aside until needed. 3.Mix together 2 1/2 cups of the shredded cheese, 1/2 cup of the sauce, the chillis, and the 1 tablespoon of taco seasoning. 4.Pour 1/2 cup of sauce into the bottom of a 13x9 inch baking dish, top with layer of tortillas (breaking up tortillas to get into corners), top with layer of cheese/chili filling. Repeat layers, ending with a layer of sauce. Top with 1/2 cup of cheese. 5.Serve with sour cream and any remaining sauce.